To give as gifts or keep for yourself, TruthTags are fun and inspiring, with whimsical designs and uplifting messages. Each Truth Tag is printed on heavy weight, coated cardstock with a detachable keytag for your keychain and a bookmark. They fit in most envelopes and make a fun surprise when dropped in a card. Keytag features Thanking God for you on the front. 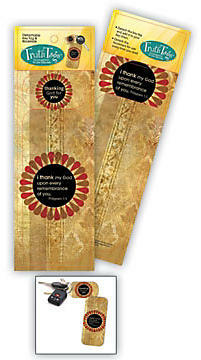 Bookmark and keytag features I thank my God upon every remembrance of you. Philippians 1:3.